LINCOLN — The Planning Board became the first of six reviewers to approve permits for a proposed $130 million wind farm that would create as much as 60 megawatts at peak winds, officials said Tuesday. 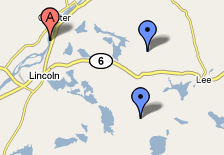 The board voted 6-1 during a meeting on Monday to approve the plan, which entails building 40 1.5-megawatt turbines on ridgelines in Burlington, Lincoln, Lee and Winn, with transmission lines in Mattawamkeag. “This is a tremendous economic boost for Lincoln. The estimated $400,000 in tax revenue [the project is expected to provide annually to Lincoln] is definitely a benefit to all the taxpayers in our community,” Town Manager Lisa Goodwin said Tuesday. The project needs approval from the other towns, Maine Department of Environmental Protection and U.S. Army Corps of Engineers. If those approvals come, construction is likely to take a year, First Wind officials have said. The approval process is expected to last three or four months. First Wind officials and some residents touted the project as an economic boon to the region. They said it would create, at maximum capacity, about 60 megawatts of pollution-free electricity for the New England grid and employ as many as 10 full-time workers locally. A group opposing the project, the Friends of Lincoln Lakes, have said that the project’s massive 380-foot turbines would blight the pristine landscape, threaten human and animal health and lower land values while typically generating a fraction of its capacity and failing to immediately reduce local residents’ electric rates. The leaders of the group, which has retained an attorney, could not be reached immediately Tuesday for comment.